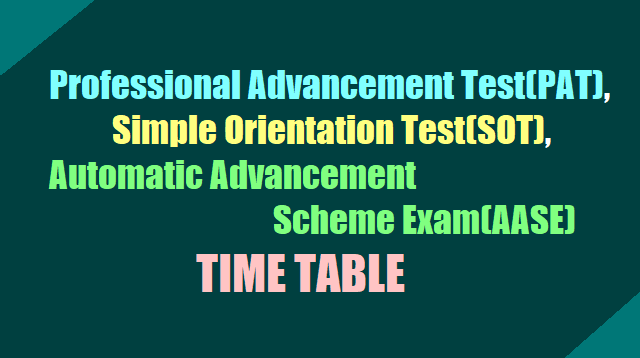 The Professional Advancement Test for the in service teachers in the cadre of SGBT(PAT) Grade-I Pandits(Simple Orientation Test) / Grade II Pandits(Automatic Advancement Scheme Examination) / Special Teacherrs and PETs (AASE) will be conducted on 22.12.2017 at Vijayawada, Kadapa, Hyderabad Districts / places. The timings of the Examinations are 10.00 AM to 1.00 PM and 2.00 PM to 4.30 PM. Elementary Grade(SGBT/EGBT) Teachers and Junior Inspectors of Schools.